Ready to create an ebook? Check again. If you thought you were ready to start making an ebook, I’m sorry to disappoint you. 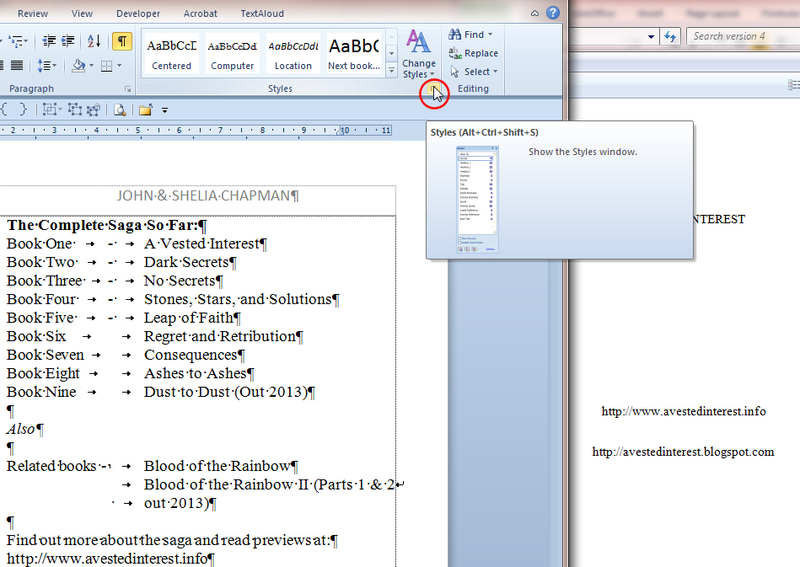 Word makes a horrible mess of its files which may look fine but will totally confuse ebook conversion programs. Before you can make an ebook you’ll have to correct this. The method I use works for Amazon and Smashwords. The first step is to clean up the styles used. Stage 1 in creating your file should be to remove all the hidden data and personal information in Word documents. Make a copy of your document and remove the unwanted stuff from the copy. To do this in Word 2007+, use the Document Inspector. 1. Open the Word document copy that you want to inspect for hidden data and personal information. 2. In the copy, click the ‘File’ tab, and then click ‘Info’. 3. 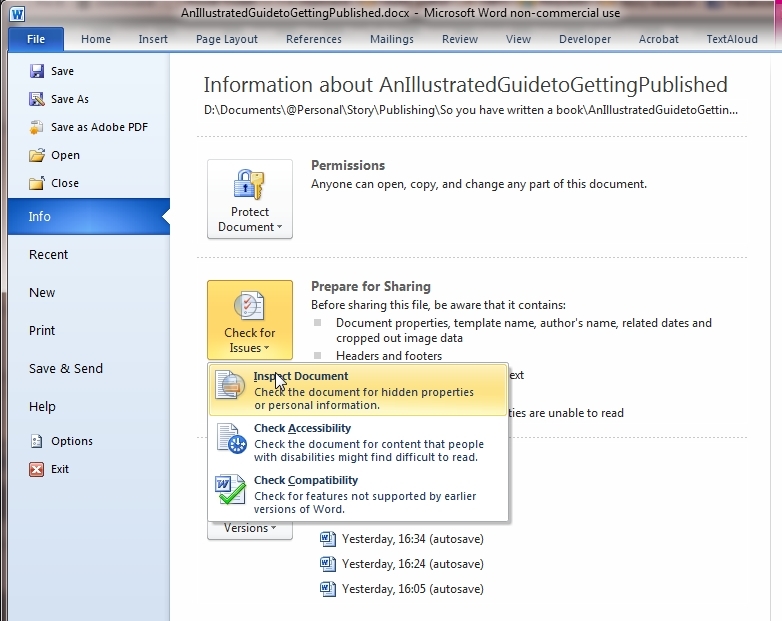 Under ‘Prepare for Sharing’, click ‘Check for Issues’, and then click ‘Inspect Document’. 6. Review the results of the inspection in the Document Inspector dialog box and click each of the ‘Remove All’ buttons. Stage 3 is to remove the unnecessary styles. Word has a nasty habit of using lots of styles which seem identical but will stop your ebook formatting properly. There are three methods of correcting this. You can either remove all formatting, then apply just the styles you want (what Smashwords calls the nuclear method) or you can go into Word, select each style in the document and remove that style if it’s unused or change the style to one of a restricted selection. Finally you can remove unnecessary styles after you have created an epub file by using the Calibre editor. Use the first method if you have only used a single style in your book. Use the second method if your document is more complex like this one. 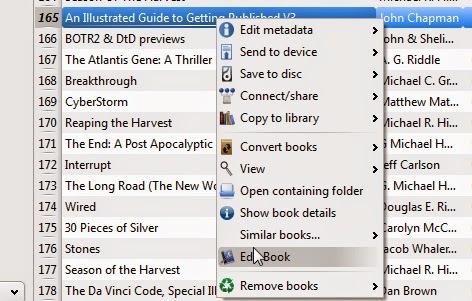 Use the third method to ‘fix it later’ if you’ve already created an epub file or submitted a document to Smashwords and it refuses to go through ‘Meatgrinder’ or pass epubcheck. Smashwords Nuclear method: Open your file in Word, select all the text (Ctrl A), copy it (Ctrl C) and paste it (Ctrl V) into a text editor such as Windows Notepad. Close and then reopen Microsoft Word to a fresh new Word document, then copy and paste the book from Notepad back into Word. You can then re-apply the minimal necessary styles. The Style removal method: This method is much more complex but might be preferable if you have used bold text, italic text or have a large document. In our novels we use italic text for thoughts, stressed spoken words and for the remote side of telephone conversations. 1. Click the Styles menu button – the tiny icon at the bottom right of styles section on Home ribbon. 2. Click the ‘Options…’ link at the bottom right of the ‘Styles’ window. 3. Set ‘Select styles to show’ to ‘In use’. 4. Right click each style you DON’T want and select ‘Select all X’. Word will select all text which uses that style and you can now select the appropriate style from the minimal styles you wish to use. 5. Reselect the style and delete it once nothing is using it. Add your Word document or Epub file to Calibre. Add the cover and Meta information if you have not already done so. Add a table of contents if you have not already done so. 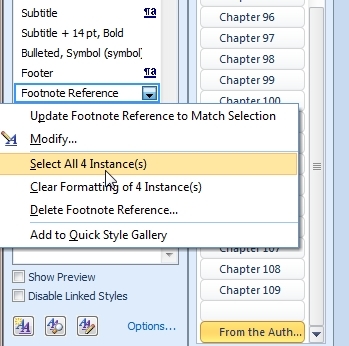 Right click the document in Calibre and select ‘Edit Book’. 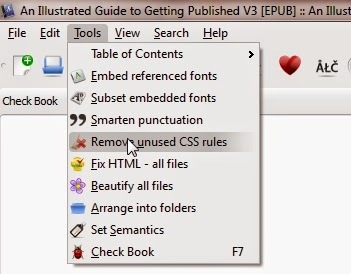 From the ‘Tools’ menu select ‘Remove unused CSS rules’. You’ll probably find it useful to then select ‘Fix HTML – all files’ also. Stage 4. Create the front content of your book. 1. Title page – Remember the maximum font size used here should not exceed 16 pt and you should not use four or more consecutive new lines. 2. Copyright notice – Follow the format used in this example from the book ‘A Vested Interest’ I co-author: The bits you need to alter are in square brackets. [John & Shelia Chapman] have asserted [their] right under the Copyright, Designs and Patents Act 1988 to be identified as the author[s] of this work. This book is a work of fiction and, except in the case of historical fact, any resemblance to actual persons, living or dead, is purely coincidental. Done all that? Use ‘Save as…’ to save your document as a Word 97-2003 document (*.doc) file if you want to publish on Smashwords or as a docx file if you want to send it to Calibre to create an epub file for KDP. Hint – don’t use any spaces in the filename! It will save you a lot of problems later. Now you’re ready to create an ebook!